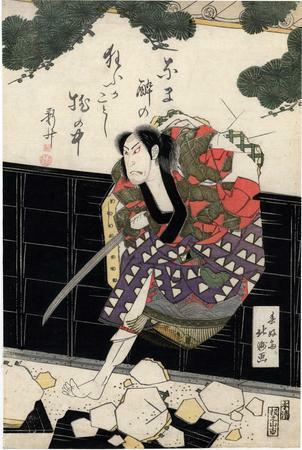 The Osaka actor, Ichikawa Ebijurō, bursting through a wall with his sword drawn. The liberal use of metallic inks would indicate that this is from a deluxe edition. A description of this play can be found at http://www.kabuki21.com/rampei_monogurui.php. Kabuki21 notes: "The play 'Yamatogana Ariwara Keizu' was originally made up of 5 acts. The fourth act is the sole surviving act and is commonly called 'Rampei Monogurui' ('Rampei's madness') [蘭平物狂]." 1) In Ikeda Bunko, Kamigata yakusha-e shūsei (Collected Kamigata Actor Prints), vol. 1, Ikeda Bunko Library, Osaka, 1997, no. 110.